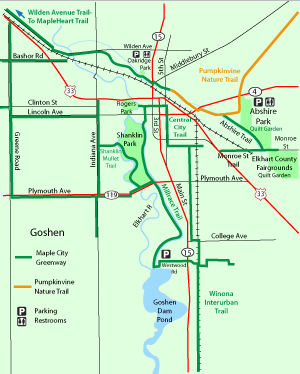 The Pumpkinvine Nature Trail, the Maple City Greenway and the MapleHeart Trail are a regional network of trails that connect Elkhart, Goshen, Middlebury and Shipshewana. The information below is intended to advise you where to find parking when you use the trails. The information is organized starting with Ox Bow Park near Elkhart and proceeding eastward toward Shisphewana. GPS coordinates for each parking location as well as links to Google maps are presented below each map. A Pumpkinvine Nature Trail map is available for download in pdf format. Ox Bow Park is located on County Road 45 adjacent to the MapleHeart Trail between Elkhart and Goshen. If you are on U.S. 20 turn south onto U.S. 33 and proceed 2.4 miles to Ferndale Road, the fourth stop light not including the two stoplights at the U.S. 20 exit. Turn left across the railroad tracks and the entrance to Ox Bow Park will be straight ahead. There are several parking lots in the park. There are also trails that lead out of the park to the MapleHeart Trail. If you turn south on the MapleHeart Trail you will reach the Maple City Greenway within two miles. This route will take you to downtown Goshen, 4.9 miles, and then to Middlebury, 15.9 miles, and Shipshewana, 22.7 miles. Turning right from the park entrance onto the MapleHeart Trail will take you to Elkhart at Hively Ave., three miles. There you can take the Sterling Ave. on-street bike path further north into Elkhart. There several public parking lots on Fifth St. in Goshen north of Ind. 4 (Lincoln Ave). From the parking lots go west one block to Main St and turn north. Cross the Norfolk & Southern Railroad tracks and watch for a safety island in the middle of the street. The trail crosses through the island. A left turn will take you to the MapleHeart Trail at 3.2 miles, Ox Bow Park at 5.9 miles and Elkhart, at eight miles. 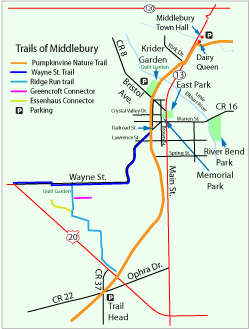 A right turn will take you onto the Pumpkinvine Nature Trail toward Middlebury, 10 miles, and Shipshewana, 16.8 miles. U.S 33, Ind. 15 and Ind. 4 intersect on Main St. in Goshen near the county courthouse. Turn east on Ind. 4, Lincoln Ave., and proceed across the Norfolk & Southern Railroad tracks. Continue an additional three blocks to find Abshire Park on the right side. Departing from the trail head in Abshire Park you can turn left on the main trail and go to downtown Goshen, one mile, the MapleHeart Trail, 4.2 miles, and then Elkhart, nine miles. A right turn from the trail head will take you to Middlebury, 10 miles, and Shipshewana, 16.8 miles. A small parking lot is located at the intersection of County Road 35 and the Pumpkinvine Nature Trail about two miles southwest of Middlebury. Traveling northeast from the parking lot will take you toward Middlebury, 3.1 miles, and Shipshewana, 9.9 miles. There signs directing you southwest toward Goshen, 6.9 miles, with the first 1.75 miles being on County Roads 35, 20 and 33 and then 5.1 miles on the trail. There is a small parking lot at the intersection of County Roads 22 and 37 south of Middlebury (see the map on your right). There are a few parking spaces at Krider Garden. You should park at the Middlebury Town Hall for access to the trail in Middlebury. The town hall is on the east side of Ind. 13 immediately north of the Dairy Queen (see the map on your right). After parking at the town hall you need to go south about 500 feet on Ind. 13 to the Dairy Queen parking lot. The trail is on the south side of the driveway into the Dairy Queen. Traveling east on the trail will take you to Shipshewana, 6.3 miles. The southwest direction will take you to Krider Garden, 0.5 mile, and Goshen, 10.5 miles. There is a parking lot at the intersection of the trail with County Road 43. The intersection is 3/4 mile north of County Road 16 between Middlebury and Shipshewana. Middlebury is 1.7 miles west of the parking lot and Shipshewana is 4.6 miles east. The Pumpkinvine Nature Trail ends at County Road 850, 0.6 mile west of Shipshewana. Parking in Shipshewana is available at Pac-a-Sak at the intersection of State Road 5 and County Road 250 N. You can also park in the lot near Wolfe Park (see the map on the right). To reach the trail from Shipshewana proceed west on County Road 250 N, Middlebury St., about 0.5 mile and turn north on County Road 850 W. The trail is about 0.1 mile north on the west side of County Road 850 W. The distance to Middlebury is 6.3 miles including the on-road route to the trail.